Wristbands are a popular promotional product for many companies – especially those that are involved in the children and adult entertainment industry such as play centres, nightclubs, festivals and events. They are an easy way to identify those who have paid for a ticket or entry into the business and are a great little product for people to take away with them. But branded wristbands aren’t just for entertainment purposes; many educational groups will use products such as our Slap Bands for promoting things such as healthy eating or reading. Higher educational groups find the USB Wristbands a popular option, especially when given at introductory sessions or orientation sessions. Branded wristbands are also popular with church and religious groups, especially when doing a big youth event or function. 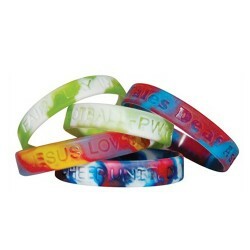 Our Debossed Wristbands can be a great way to get message of hope through to a younger audience. Essentially promotional wristbands are used to communicate a message to a range of audiences, much in the same way products like pens, hats and mugs are. 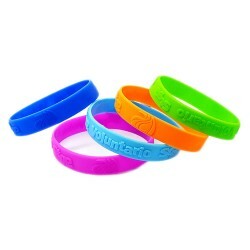 Like many of these other products, branded wristbands are a constant source of advertising and marketing for your brand. They can be worn over and over again particularly in a younger audience – essentially they are a visible promotional product that will be seen in public more than a branded pen or mug. Like other branded items, wristbands are a collectible for some people, so a well-made and well branded wristband may be around, marketing your brand, for years to come. One of our more popular wristbands, especially within the nightclub and entertainment sector is our Glow in the Dark wristbands. These wristbands make it easy to see patrons in the dark, making them perfect for night time events to allow entry or to spot someone who may have wandered off. 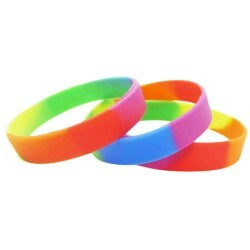 Our Sectional Coloured and Multi Coloured Wristbands are the perfect addition for your next concert. 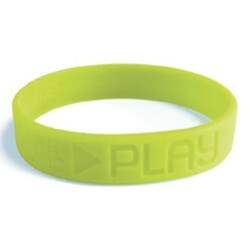 These wristbands are bright and bold and look great once printed. 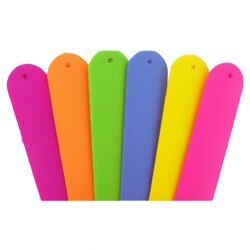 These have been a popular choice with companies who promote concerts to a younger audience, while the Printed Silicone USB Wristbands are great for your next sporting event, whether you provide them to the participants as a way of ID’ing them, or give them away as promotional items to spectators. Our Embossed Wristbands are starting to gain popularity with a range of businesses as an all-round promotional product for both adults and children, whatever the industry or event. Printed Silicone USB wristbands are a great promotional product especially if your business deals with youth or young adults; often a wristband will be left on, or worn over and over again (especially with younger children) so give you an option to market your brand or product over a period of time or to an audience your general marketing may not reach. For adults, they can be a great way to identify attendees at events or perfect giveaways when promoting a new product at a product launch. 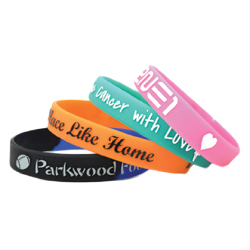 Wristbands are a price effective product that are easy to brand and continue to look great. They are easy to transport, unlike some other branded items, which mean they are great to carry from event to event without adding too much weight. If you need a promotional wristband for your next event or function, take a look at our range – you won’t be disappointed.